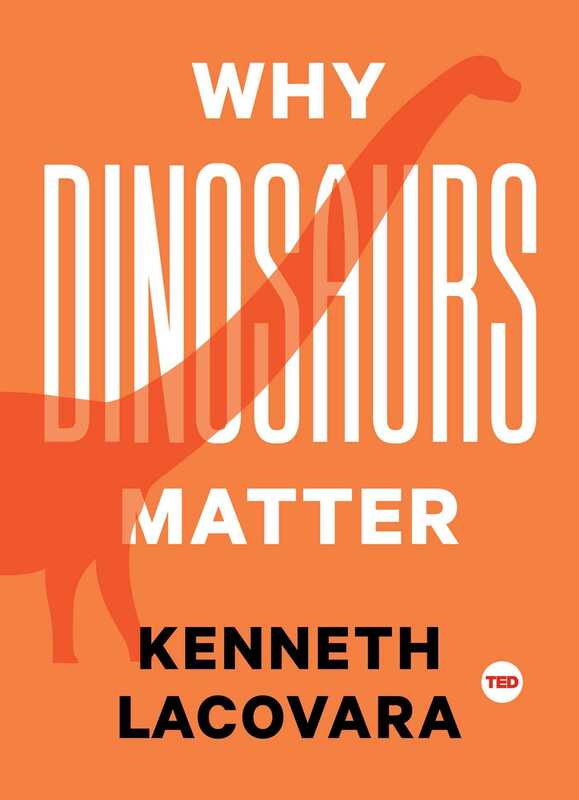 Dr. Kenneth Lacovara’s Why Dinosaurs Matter is a “TED Book,” meaning a book-length expansion on a single TED Talk lecture. The afterward claims that TED Books are designed to be read in a single sitting, but that’s a stretch; readers of average frequency could extract a three or four day experience. While this book certainly contains a few beautiful, contemplative moments, it gradually feels like a collection of online science articles, and fails to provide a cohesive punch. Dr. Lacovara takes some detours that vary in their levels in excitement and subject-relevance, before finally delivering (in the last chapter) a direct statement on why dinosaurs should actually matter to us. The finished product will please readers to an extent directly proportional to their predisposed interest in paleontology. To be sure, there are indeed some interesting questions explored throughout this book’s 150 pages. Is a penguin a dinosaur? Do the T-Rex’s notoriously small arms actually provide an evolutionarily important survival advantage? What is the origin story of the phrase “She sells sea shells by the sea shore?” Is standing still an effective way to evade detection by a T-Rex, as depicted in Jurassic Park? (I’ll spoil that last one for you. The answer is no.) While this book does have some interesting facts peppered throughout, a few of its twelve chapters are underwhelming for glaring reasons. 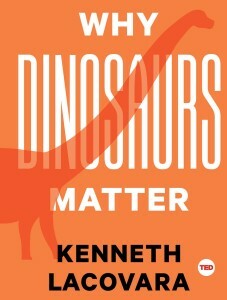 Why Dinosaurs Matter falls victim to an unfortunate trend in consumer-friendly nonfiction books designed to deliver a survey of essential facts and histories surrounding a specific subject matter. One might cheekily call it “how-we-got-here-itis.” Dr. Lacovara spends a great many pages chronicling the very beginnings of this field of study, then walks us through the major discoveries across the centuries that helped advance our understanding of dinosaurs. The issue with this is tedium. Lacovara includes explanations of how humans once believed that dinosaur bones fell from the sky, and he details the gradual chain of events that led the scientific community to reject the premise that the earth is 6,000 years old. There are sections about the earliest dinosaur exhibits at museums, including their many incomplete, erroneous inclusions due to the limited scientific understanding of the time. Readers looking to learn about the cutting edge of dinosaur paleontology must first stumble through chapters of pseudoscience and dull history lessons before arriving at the book’s real goods. Using the “Why [insert subject here] Matters” naming template is a lazy and often-abused method of drumming up interest in potential readers. Does Dr. Kenneth Lacovara deliver? The answer is mostly yes. He does an excellent job putting into clear perspective not just the mightiness of the dinosaurs, but also the shocking length of their planetary dominion, clocking in at 165 million years. Reflecting on the human race’s comparatively quick 200,000 year history certainly justifies a humble reverence for the ancient, elegant planet we inhabit. The earth is a playground for evolutionary history that has stretched so many eons, it’s difficult to fathom meaningfully. Lacovara’s bigger point is that if a dinosaur kingdom with such strength and longevity could be wiped out so completely and abruptly, we modern humans need to consider how our lifestyle leaves us susceptible to a similar cataclysm. While these ponderings are certainly profound, they stray from dinosaur-specific content at length, focusing more on the “deep time” required to formulate the earth and the fascinating nature of natural selection for all life forms in general. Providing this background as a way of contextualizing the jurassic era is fine, but it’s odd to devote such length to it in what would appear to be a mini-book about dinos specifically. The sections that do highlight the specifics of interesting species are surprisingly sparse. They also could have benefited greatly from illustrations to demonstrate the scale and biology of the creatures described. Sadly, it is factually true to say that there are plenty of children’s books that would provide a more concrete understanding of these prehistoric species. All we get here are artwork interludes that interrupt the text; each is a two-page spread that offers symbolic graphic design in lieu of any meaningful, scaled representation of the dinos at hand. Why Dinosaurs Matter isn’t a bust, but it doesn’t deliver the memorable, efficient knockout that a mini-book like this is intended to provide. Lacovara clearly knows his stuff and has no shortage of genuine enthusiasm. But the finished product is hampered by its excessive scientific histories, a noticeable lack of visual aids, and sections that, while engaging, are tangential to dinosaur culture. You may be just as sufficiently served by watching the 16-minute TED Talk itself, available online to everyone for free. If it satisfies your appetite, you’ve saved yourself a few hours and fifteen dollars. On the other hand, if you’re itching for more, this small-book-length expansion will serve your curiosity quite nicely.